The most obvious and symbolic element of Chanukah is the ’chanukiyyah (commonly, though inaccurately, called the m’norah), used for the commemoration of the alleged miracle. 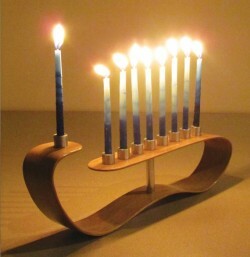 The chanukiyyah is usually a nine-branched candelabra designed to hold eight Chanukah candles, one for each night, plus the shamash (meaning “servant”). In typical fashion, the shamash is lit, then used to kindle each Chanukah light in turn: on the first night, one light; on the second night, two; and so on, until all eight lights are kindled on the last night of the Festival. The chanukiyyah, while apparently ancient, is not explicitly prescribed by the Rabbis. Neither is the use of candles as Chanukah lights. Indeed, most of the Talmudic references are to oil lamps. For example, Mas. Shabbath 23a, discusses which kind of oil is best for kindling the Chanukah lights (evidently, it’s olive oil). But what is truly intriguing about the traditions surrounding the chanukiyyah, is that the most common method used today for kindling the Chanukah lights was originally meant only for the “extremely zealous.” You may be surprised to know that according to Mas. Shabbath 21b, only one Chanukah light per household is “demanded,” and any increase in the number of lights is merely an indication of one’s “zeal.” According to the Rabbis, each household must light at least one Chanukah light per night; for the “zealous,” one light nightly for each member of his household; and for the “extremely zealous,” eight lights—with Beth Shammai saying to reduce the number by one each night, and Beth Hillel maintaining that the lights should progressively increase each night up to eight. In short, there’s more than one way to kindle the Chanukah lights, and the traditions and rituals are not quite as fixed as we have been led to believe. Some other Talmudic instructions concerning the Chanukah lights include the exceptions for placing the lamp inside the home (it’s supposed to be outside), how far from the doorway it is allowed to be, how high above the ground is acceptable, and who must pronounce a blessing and what that blessing must be. The Talmud also includes prohibitions against using the Chanukah lights to perform the natural functions of a household lamp—i.e., casting usable light, providing heat, or transferring a flame from one lamp to another. This, of course, renders the Chanukah lights useless for all but one task, and it is an extremely limited (though charming) one, at that. Additionally, it is from these prohibitions that the tradition of the shamash arose. Since the Rabbis forbid the use of the Chanukah lights for natural purposes, the shamash—not being one of the Chanukah lights itself—was added as a ceremonial convenience. Should we not find it curious, then, given the extraordinarily non-authoritative nature of the Rabbi’s opinions, that something as innocuous as the shamash would garner such profound meaning in Messianic and Jewish Roots circles? Though it is an entirely contrived, completely rabbinic innovation, the concept of the shamash really “preaches”—especially to a Messianic audience. The mundane purpose of the shamash notwithstanding, it is easy to make the leap to a brilliant representation of Yeshua: a set-apart “servant,” yet elevated (as on some modern chanukiyyot) above all others, setting them aflame with His holy light, so that they in turn may shine that light, and brightly penetrate the darkness of the world around them. Indeed, “the Son of Man did not come to be served, but to serve” (Matthew 20:28), and He is “the true Light, which enlightens every man” (John 1:9)! Without a doubt, it is a glorious portrait of our Master—even more so when we imagine that this picture has been amazingly “hidden” for centuries in plain view of His own Jewish people. But the fact of the matter remains: when we “see” Yeshua in the chanukiyyah, we are “seeing” Him in a “Rabbinical [institution]” (Mas. Shabbath 24a)—we are being inspired by a man-made prohibition against nature and reason. As disciples of Messiah, we have an abundant treasure of spiritual richness in the legacy of the Scriptures. Can we not honor and observe a holiday established by our forefathers without camouflaging and disfiguring it with more spiritual meaning than they intended? Does the chanukiyyah’s shamash represent Yeshua? It certainly can, if we choose to see it that way. But if we do, isn’t it possible that we’re just “seeing things” where they ought not to be? Or, at least, making too much out of something that was never meant to get our attention? Intrigued? This was just an excerpt from the Appendix of my book The Real Story of Chanukah. That question is applicable to many things messianic…and I believe the answer should be: yes, we must not honor and observe… but must camouflage and disfigure— if we are to continue in the traditions—especially those that are anti-Yeshua. Very well said. I love it when truth comes together. My family chooses to “see things” as the shamash helps my 5yo son see Yehoshua better. As time goes on we may remove it. As always, Kevin, thank you for truth. Shalom Pam — good to hear from you. In defense of a full-on observance of Chanukah, many Messianics are quick to point out the ironic fact that while Chanukah is not mentioned anywhere in the Hebrew Scriptures, it is referenced in John 10:22-23. This passing detail in the text—like Chanukah itself—tends to receive uncharacteristic veneration. Because the Master Himself is seen walking in the Temple during Chanukah, the reference is often inflated to mean that Yeshua celebrated Chanukah—and, therefore, Messianic believers should, too. Yet nothing in the passage indicates that Yeshua was attending any kind of Chanukah celebration. On the contrary, Yeshua goes on to engage the unbelieving Jews in debate, ultimately forcing Him to leave the scene or risk being apprehended. The Master may indeed have participated in Chanukah celebrations at one time or another, but they would have been far removed from the modern Chanukah observance of today. Be that as it may, this mention of Chanukah in John does not make the holiday divinely ordained or incumbent upon Messianic believers in any way—as a Feast, it just doesn’t hold a candle to ADONAI’s Scripturally appointed times. Shouldn’t that fact alone give us pause regarding the amount of effort and consideration that we give to its celebration? And what about the idea that Yeshua “fulfilled” Chanukah by being conceived during the holiday (and then born in the Fall, during Sukot—as opposed to Christmas)? Suffice it to say that even after a good deal of clever, yet ultimately unconvincing, Scriptural mathematics, it is quite contrived to suggest the Master’s fulfillment of a man-made celebration. I believe this is simply a case of taking a good thing (seeing Yeshua as the fulfillment of certain holy days) just a little too far. Kevin, I have to say I expected this answer from you and I am not disappointed. Nothing taken away, nothing added to His Word – I am so grateful for your ministry. “if the miracle of the oil isn’t true” from the comment above gave me pause. what do you have to share about that idea? Rene — I guess you haven’t read my book. 🙂 There’s no reason to believe that the miracle of the oil is true — it is a Talmudic legend. From “The Real Story of Chanukah,” p. 18, “But of the events referred to in the Talmud’s definition of Chanukah, all of them are verifiable by historical sources, save one: the “miracle” of the enduring holy oil.” The Chanukah celebration, according to the books of Maccabees (which is the source material for the Chanukah story) has nothing to do with miracles of oil.